Wishing all my fellow bloggers and friends a Very Happy Diwali, many of us would be busy with last minute sweet preparations and decorations, for those who love fireworks, have a Safe Diwali. 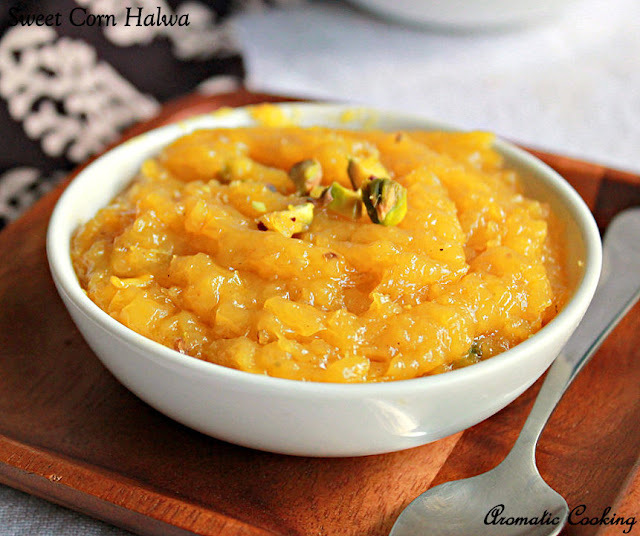 Today's post is going to be another easy sweet dish, Sweet Corn Halwa. 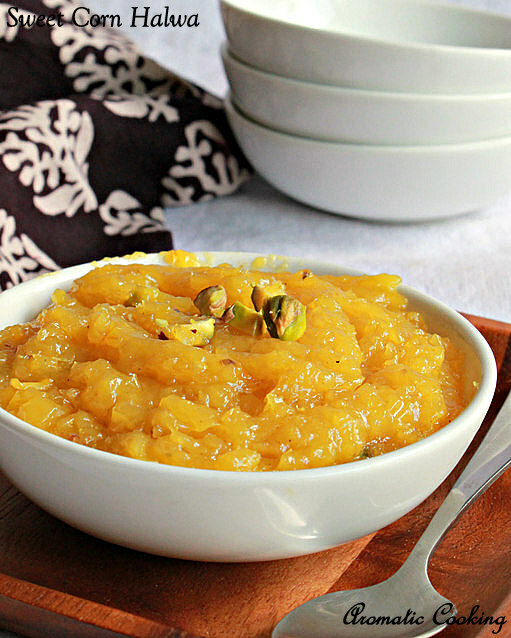 I never thought that we could make sweet dish with sweet corn, until I saw this halwa here. 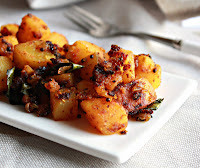 I have made vadas with it, long time back, but usually I boil it or grill it. 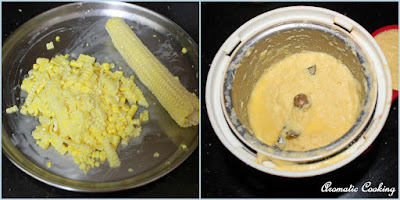 After doing the sundal with sweet corn, I had one more lying in the refrigerator, and I wanted to try something new with it or something new that I have not made with sweet corn. Most of the corn halwas that I found on the net used mawa or fresh khoya in it, I didn't have either and I was a little lazy to go out and get it. Then I found this one which used just milk, the method was almost similar to the one used for making Lauki ( Bottle Gourd ) Halwa. The recipe as such is very simple, the only thing that takes time and patience, is sauteing the corn well, otherwise the halwa will have the raw smell of corn. 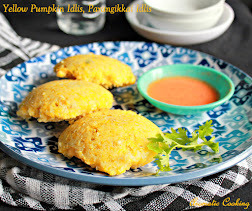 If you like the other halwas made with vegetables like lauki, carrot and beetroot, then give this a shot.. 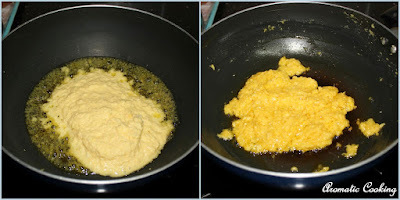 Remove the kernels from the corn and grind it into a smooth paste, it came to about 3/4 cup. Melt the ghee, add the ground corn and keep sauteing it on medium/low heat for about 15 minutes till the raw smell of corn goes away and it starts leaving out the ghee. Now add the milk and 1/2 cup of water and cook for another 10 minutes. Then add the sugar and mix, keep mixing for another 5 minutes or so, till all the moisture is gone and again the halwa starts leaving out the ghee. At this stage, switch off the stove and add the cardamom powder ( take the inner pods and powder ), saffron threads and mix, garnish with the chopped pistachios and serve it hot or warm. It's very important to saute the corn well, otherwise the halwa will have the raw corn smell. Add the cardamom at the very end, this takes away the smell of corn. Wow !! what a different and healthy halwa..Happy diwali to you and your family hema. looks so comforting! 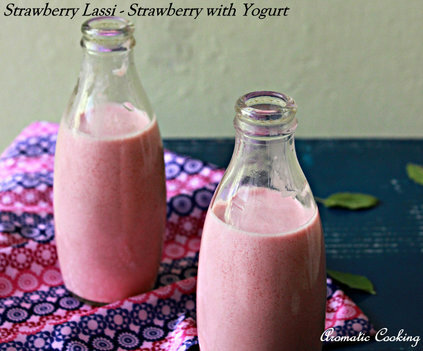 perfect to indulge on a diwali day! 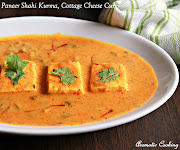 good recipe Hema! This is definitely a different kind of halwa. I would not have thought of making halwa with sweet corn. Happy Diwali. This is a new recipe for me, colour looks very nice. 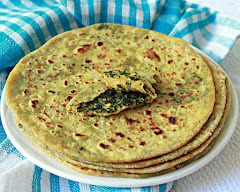 I am hosting My Legume Love Affair for the month of November, which is an on going monthly event since 2008, in which bloggers from all cuisines are presenting there vegetarian legume recipes. Very interesting and unique halwa!! lovely color! !